Product prices and availability are accurate as of 2019-04-09 03:52:50 EDT and are subject to change. Any price and availability information displayed on http://www.amazon.com/ at the time of purchase will apply to the purchase of this product. 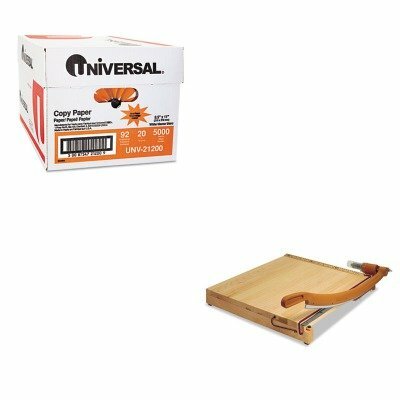 lt;stronggt;SWI1162lt;/stronggt;lt;BR/gt;Swingline ClassicCut Ingento Solid Maple Paper Trimmerlt;BR/gt;Count on this classic for solid performance. Safety spring washers secure handle in any position to prevent accidental falling. Non-slip rubber feet. Trimmer Board Type: Bypass Sheet Capacity: 15 Cut Length: 24amp;quot;.lt;BR/gt;lt;BR/gt;lt;stronggt;UNV21200lt;/stronggt;lt;BR/gt;Swingline ClassicCut Ingento Solid Maple Paper Trimmerlt;BR/gt;For copiers. Great for everyday use. Acid-free for archival quality. This product was made from wood that came from a certified managed forest. Size: 8 1/2 x 11 Paper Colors: White Paper Weight: 20 lb Sheets Per Unit: 5,000.